The view of Hardy's bay from Allen Strom lookout, Bouddi National Park. Hardy's Bay/Killcare is located on the Bouddi Peninsula in the greater Sydney area just one and one half hours drive from Sydney CBD or a twenty minute ferry ride from Palm Beach to Wagstaff. It is the secret gem of the Scenic Central Coast surrounded by National Parks, exquisite headland bush-walks and secluded beaches many of which are only accessible by foot and water. Hardy's Bay Yacht Charters depart from the village precinct of Hardy's Bay. Depending on local weather conditions, sailing charters head out of Brisbane Water past beautiful Lobster Beach and across the bar at Box Head, this takes approximately twenty minutes under motor. 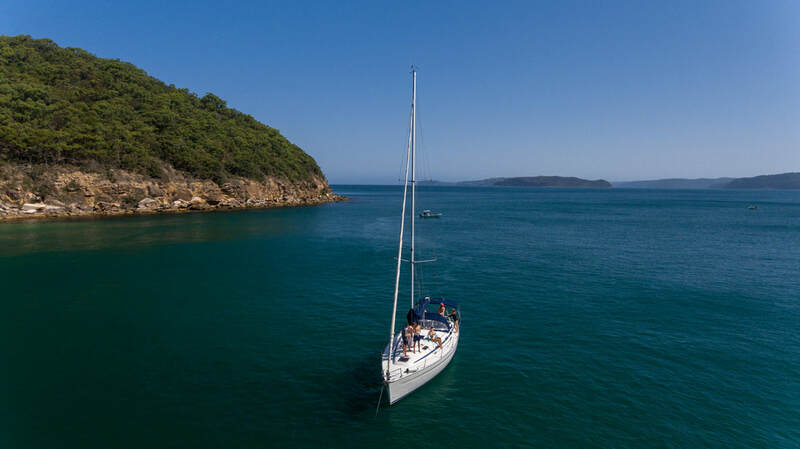 We raise the sails on Broken Bay where the swell and wind are at their finest, sailing around the fairy penguin rookery of Lion Island and into the Hawkesbury and Pittwater Waterways. Iron Ladder Bay is often frequented as it is only accessible by water and provides a great opportunity for a swim from the yacht. Dropped the Anchor at Iron Ladder, Bouddi National Park. Now time for a swim!